Professor Marlo Ransdell PhD, IDEC and her student Amanda Cleveland show us their final projects. Graduate Furniture Design: Students were engaged for six weeks of designing and fabricating two full-scale furniture pieces constructed from one 4’x8’ sheet of 3/4” maple plywood. Criteria for the project was: create two designs in Rhino software that could be CNC manufactured and flat pack shipped, have the ability to be constructed with little to no tools and hardware, and minimize material waste. Students were given no limit on the number of scale models to produce and had classroom access to all prototyping equipment (additive, subtractive, and laser) for small-scale prototype production. All prototypes created were evaluated for form, function, and material application and photographed by students. Final full-scale prototypes were developed on a 4’x8’ CNC router at the Facility for Arts Research at Florida State University and evaluated. FAR-FSU is a certified RhinoFabStudio. 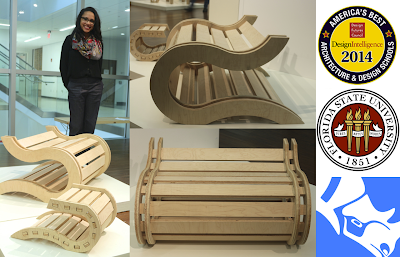 To see more projects of FSU's Graduate Furniture Design, click here.